There’s an almost religious fascination with credit scores these days, even and especially on personal finance blogs. What’s your score? How much has it gone up (or down)? What’s your credit utilization rate? (I REALLY love THAT one!) How long have your credit lines been open? Do this or that and raise it higher. There’s an unspoken inference that “you are your credit score”. OK, maybe I’m going a bit over the top, but it’s certainly a short walk to step across that line. Question: is it possible that we’re taking this interest too far? Like maybe it’s become a fascination, even”¦an obsession? It’s reminiscent of the times when oil prices spike and all things automotive morph into M.P.G.—miles per gallon—where suddenly the primary inherent value of a vehicle is to be found almost exclusively in its fuel economy. Legitimate concern or another episode of “mines better than yours”? You have to wonder—given that credit scores are a number—if credit score mania hasn’t finally taken its place in the “mine’s better than yours” game that seems hardwired into the human psyche. We’ve had plenty of previous experience playing this game with houses, cars, salaries, jewelry, clothing—virtually anything we can put a number on. Numbers mean we can compare ourselves with others as a metric to determine how well we’re doing. Are you down in the dumps because you have a low credit score? Are you beating your chest telling others what your score is because it’s a good one? 12 time NFL All-Pro defensive end Reggie White counseled younger players saying, “You’re never as bad as the media says you are; you’re never as good as the media says you are.” A parallel can be drawn with credit scores. Though credit scores seem to be the Holy Grail of credit in some quarters, it’s important to recognize its limitations, and there are a few. A credit score is temporary! It measures where you are right now, as in this month, and can take some wild swings as circumstances change. Sometimes they change because of changes in scoring criteria, sometimes because of a shift in your credit profile (closing out a credit line, opening a new auto loan). And it goes without saying that a late payment or two can cause a sharp swing to the downside. But what ever it is right now, it will change. In my years in the mortgage business I saw “A” borrowers become “B/C” borrowers, and “B/C” become “A”. Credit scores have diminishing returns. Once you get beyond a certain score, say 700, further increases in the score become less significant. There’s no need for a person to seek credit score perfection in the ordinary course of life. Even if you could attain the highest score possible, it’ll change. See the point above. Your life shouldn’t be reduced to a number. Businesses and even the government may try to turn us into numbers, but as living, breathing human beings, we need to have no part in it. The quality of our credit is central here–not the level of our credit scores–and that’s what we need to focus on most closely. A very high score can actually turn against you. With a high score you can be line for sweetheart loans and credit lines that you wouldn’t get if your scores were lower. That can have the potential to put you deep in debt more easily than you think. I saw more than a few people carrying unsustainable debt loads with credit scores well in excess of 700. They carried high debt because they could! The lenders even said so. Tracking your score can pull you away from more productive activities. Trying to juice your score by keeping credit card utilization at Level X strikes me as a activity undertaken by someone with too much time on their hands. Is there anything more productive you could put that time and concern to—earning extra income perhaps? Are there some health matters you need to be tending to? Are there people in your life who may be in need of your help? All of these are more important than optimizing your credit score. And the interesting thing is, take care of each of these, and your credit scores will take care of themselves—no further concern is necessary. Do you agree that we might be worrying too much about credit scores? If not, why do you feel that the concern is justified? When buying a house credit will matter so that is the time to get vigilant. Maybe when car shopping too. Otherwise our time is better spent focusing on improving our situation by focusing on the debt and making on time payments. Daniel, thanks for the comment! As long as we keep debt to a minimum, pay our bills on time and keep mistakes off our credit reports, our scores will be ready when we need them to buy a house or car or anything else we need to do. It’s one of the ironies of finance that those with the highest scores are the least likely to need it. And if circumstances occurred where they might need it, job loss, underwater mortgage, and upside down car loan, the score is likely to drop quickly to match. I’m with Dave Ramsey, (and Kevin), ignore the credit score, have a hefty emergency fund, pay cash for vehicles, and pay off the house. Definately Robert! With enough cash, credit becomes less necessary, especially in ordinary circumstances. It’s worth noting too that some of the highest credit scores are for the over 65 age bracket, mostly for those who have paid their debts and have stayed out of debt since. That’s something to strive for. Great point! If everybody just concentrated on those good financial habits, their score would take care of itself. This is going in my weekly favorites on Saturday. Agreed! Just pay your debts on time and use common sense and your credit score will be fine. When will the obsession stop? You know how FICO includes your net worth and income in the credit score calculation? Oh wait, THEY DON’T! I meet people living paycheck-to-paycheck all the time that have awesome credit scores. The funny thing is that the credit score likely got them there: they kept borrowing more money because it was available until every dollar that comes in the door has to turn around and walk back out the door in the form of payments. You rarely hear about financially successful people squabbling over credit scores, mainly because they don’t really borrow any money. EXACTLY Derek! I’ve seen that more times than I can count. Credit scores are limited to credit profile and have nothing to do with income or net worth. In theory, you could be broke and unemployed and have an 800 score. I was fully expecting a post that mimic’s my thought about credit scores – “I don’t need a great credit score because I’ve learned to stop borrowing money”. Your post didn’t deliver that message BUT I was pleasantly surprised by a couple points you made. Thank you for highlighting a few of the lesser-known problems with “building your credit score” like ‘Mine’s better than yours’ and ‘Tracking your score can pull you away from more productive activities’. True! GREAT POST! Steve – I actually thought about taking the “I don’t need a great credit score because I’ve learned to stop borrowing money” approach, but there are a few reasons why you need a good (not perfect) score, so I didn’t go there. A good score is reflective of well managed credit; beyond that there’s no need to engage in a credit score arms race. It’s like we are in grade school again. As adults we don’t get graded very often, it’s one of the only gauges we have to see how well we are doing financially. Because I’ve been a perfectionist my entire life, I do want to have a good credit score. I say I don’t care about the score now since I don’t use debt anymore, but that’s because it’s still 780! I think as soon as it gets lower it will start to annoy me. Of course I won’t get into debt to make it go up, but it’s just my nature to want everything to be the best! Jaime, if you’re not using credit, you really don’t need to worry about it sliding a bit. 780 gives you plenty of room, you could drop 50 points and still be in excellent territory. The fact that you have no debt is contributing to the high score. Keep it up! I’m glad to see the “credit score is temporary” reminder in the post! I always get caught up and want results immediately but it is good to think long term. Great article. 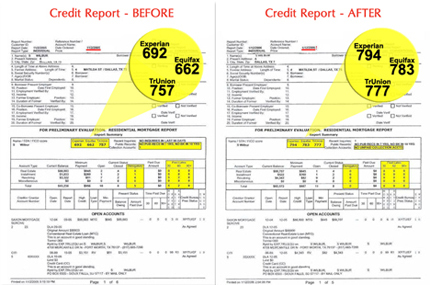 Important note: Credit scoring and credit worthiness has evolved to what it is today. From only used for home loans; progressing to car and home; further progressing to all loans and now insurance, jobs and even government security clearances. What does the future hold? Well, as my dad always said, “My crystal ball fell out of my truck and I don’t know.” But we can guess it will continue to evolve and maybe conglomerate with other matrix type profiling to mathematically rate us even further. We need to take these evolutionary progresses into consideration and not allow us to get blindsided by the future. Previous post: Should I use a Realtor to Sell My House?